Paul and I decided to create this blog together. I already had my own blog page, so this post is just a conglomeration of previous posts from my old page. I'm getting rid of my own page and just concentrating on this one! Enjoy. . .
1. I ran over my own foot while driving a three-wheeler. 2. I say "a hundred" when I have nothing better to say (or want to be obnoxious.) 3. I get a headache when I go into Bath and Body Works for more than 37 seconds. 4. I bite the inside of my cheek when I am bored, tired, anxious, stressed, etc. 6. When I eat at Chile's, I like to sort through the chips and eat all the ones that are folded or stuck together. They are extra yummy!!! 7. I love to sleep and have slept for over 12 hours at a time, on numerous occasions, just because I could. I live in Kentucky. I like it in Kentucky. But, I have a strange feeling that Kentucky does not like me. Since I have moved here I have been bitten by some type(s) of bug NUMEROUS times, two of which resulted in infections. The first time the bite just blistered and was sore, but healed up fairly quickly. Nothing to worry about, according to the nurse I work with. The second time, a spot roughly the size of my palm swelled up and hardened on my leg, turned a nasty red color and had a fever. Very painful. Time for the antibiotics, but then I developed a heinous yeast infection (one of the lovely side effects of killing the bad bacteria is that you kill the good bacteria that controls the naturally occuring yeast in your body.) Great. Two days after I was finished with that round of antibiotics, I developed strep throat. Two days! I mean give me a break. So now I am on antibiotics again and it is almost guaranteed that I will develop another yeast infection. So I have a prescription for that also. I have taken more medicine since I moved to Kentucky than I did in the last 7 years of living in Utah. Now, I don't mind bugs. As long as they stay outside my home and do their own thing, we are fine. But in the following true story of my life in Kentucky, the bug definitely crossed the line! This state is famous for horse racing and hillbillies. And boy does it have both! Something I didn't know it had was very large, very scary, MAN EATING CRICKETS! Okay, so maybe I'm exaggerating a little. They probably don't eat men, just small children, dogs and squirrels. My first experience (and, knock on wood, only) was right before bed. Not the best time to be attacked by a giant insect, let me tell you! I walked into the bathroom to brush my teeth. I felt a hair tickle my cheek and quickly brushed it back. As I was reaching for my toothbrush, it tickled my cheek again. I looked up in the mirror and realized there was a cricket sitting in my hair! As I mentioned before, it was a very large, very scary, MAN EATING CRICKET. I believe it was attempting to nibble my cheek, perhaps for a bedtime snack. Needless to say, I FREAKED OUT. While wildly flailing my arms to try to get the little (little, ha!) bugger out of my hair, I let out a scream. My windmilling arms hit a metal cup sitting on a shelf and the cricket and the cup simultaneously went flying through the air in opposite directions. The cricket landed on the floor while the cup bounced into the sink, onto the counter and plopped into the toilet. This clattering, coupled with my hysterical laughter, woke the entire house and probably the entire neighborhood. Of course, my courageous husband came to my rescue. He was trying to figure out what to do with the cricket. Should he squish it? I don't think so! Let me remind you it is a giant insect. There would be cricket guts all over the clean bathroom, not to mention the bottom of his shoe. Should he grab it with toilet paper? 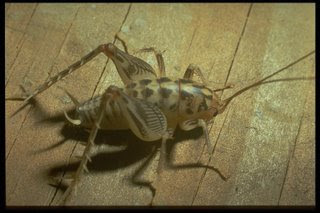 Believe me, if you had seen this cricket you would not have wanted to touch it through cardboard, let alone flimsy toilet paper! He settled on using a large bath towel to try to catch it. Of course, that smart insect knew death was knocking on his door and tried his hardest to avoid being caught. Lucky for us he hopped right towards the towel, instead of away from it and seemed content to hang out there. Paul then shook the towel over the toilet and the cricket plopped in. I am happy to report that he seemed very happy there; perhaps it was like a swimming pool to him. His little antennae wiggled and he just looked at us. I screamed, "You can't flush it down the toilet, the cup fell in there," followed by more hysterical laughter. But my ingenious husband used the water to his advantage. He smartly pulled almost the entire roll of toilet paper off the roll and plopped it on top of the cricket. The paper quickly started soaking up water, ensuring the cricket was stuck in the water. He reached in the toilet, pulled out the cup and flushed. VICTORY!!! Hopefully, the giant man eating cricket doesn't clog the pipes. . . So you see, I have reason to believe that Kentucky isn't as fond of me as I am of it. I am so grateful for my faith and belief in God. It is such a comfort to know that He is there anytime I need Him and that if I turn to Him for guidance, my life will be the best that it can be. I am so grateful for all the wonderful people I have in my life who love and support me. I am grateful for those who have faith and act on it to better their lives and mine. I am most grateful for my family. They are wonderful examples, friends, confidantes, and advice-givers! I love you guys!!!! I am grateful that I am me. I am grateful that the Lord is constantly reaching out to me and just waiting until I humble myself enough to let Him mold me into the daughter of God He wants me to be. I am grateful that He has an infinite amount of patience and is always willing to forgive me. How blessed I am to know of the power of Our Savior and His Atonement. Lastly, I am most grateful for my husband. He is such a wonderful man. He works so hard to provide for us and he is constantly letting me hear and feel his love for me. He is truly my best friend. We have so much fun together and he has proven time and time again that I can trust him with all my hopes, fear and dreams. I love you, you crazy monkey! I had my first experience with tornadoes on Thursday, October 18, 2007. It was crazy and scary. Owensboro has a warning siren that goes off whenever conditions are right to create a tornado. It went off at least 3 times on Thursday. We did end up having a tornado touch down about 3 blocks from where my sister-in-law, Lorrie, lives. We had no idea until the next day. Crazy. There wasn't any damage or problems near our apartment, so we are very grateful for that. I am glad it's over! I'm trying to get my blog caught up with my life so here is an experience from July. We had quite the thunderstorm. Paul's whole family was at the beach in Alabama and Paul was working a long shift so I was home all alone after work. I was reading Harry Potter in the den and realized it was getting dark. I thought it must be around 8 or 9, but I looked at my watch and it was only 5:30! The clouds were so dark! Then the wind started blowing. Then the thunder started booming. Pretty soon the lightning was cracking so close to the house that the thunder was booming before the lightning was done. I was freaking out. Then it started raining so hard that I could barely see the house behind us. It's maybe 20 steps from the back of the house, so that is alot of rain. I was freaking out anyways, then the power went out. Except for the lightning, it was PITCH BLACK. So, I went to the drawer where Lorrie keeps the flashlights. No flashlights. They had taken them ALL to the beach. I found one little box of matches that only had 3 left. I used the light that my cell phone puts off to gather up as many candles as possible. By this time I had texted Paul about a hundred times telling him to come home as soon as he could and I had almost started crying about a dozen times. I kept praying, "please don't let this be a tornado because I can't remember what Paul told me I'm supposed to do if there's a tornado." Very scary! Well, the power came back on about 2 hours later, thank goodness. Paul came home at the normal time and was so sorry because he didn't get any of my texts until it was time for him to leave! The rain stopped eventually but we ended up getting 6 inches in ONE hour! It was ridiculous! But, now I can say that I have weathered a terrible storm on my own! I told Paul that one of the first things we are buying for our apartment is one of those battery powered lanterns! p.s. I am happy to add that we did buy a lantern and we had it out, ready to use during the tornado warning! For those of you who don't know, I am the secretary of the Primary for our branch. It has been a very fun, very, ahem, cough, cough, educational experience. Kids are CRAZY. So fun, so delightful, but CRAZY. Today was our annual sacrament Primary program. We have been practicing for several weeks, with mixed results. Most of the kids refused to sing during our practices, and several of the older girls acted like annoyed little teenagers. I received several eyerolls, which were very unwarranted! It was pretty funny. Even after our dubious rehearsals, the kids really pulled it together today. Maybe it's because their parents were there, but they did amazingly well! I was so proud of them! Go Primary! For our regular Primary time, we had a party to celebrate our outstanding program. We played a game where we had pictures of people from the Bible and the kids would try to guess the person by the picture and clues. One little boy shouted "Jesus Christ" no matter what the picture was. It was so cute! He will also randomly raise his hand during sharing time and when we call on him he proceeds to tell us how old he is (five) and that he is hungry. He is so funny! You know what has been the most amazing to me? To see how much these kids know and understand. We'll ask them questions about stories from the Book of Mormon and they can tell us everything. They understand not only the stories, but they also understand so much of the spiritual principles that they represent. We'll explain one story and what it means and they will say, "oh, that's like this other story." They see how these stories relate to one another and how we can learn so much from them. It is awesome! Happy day! Paul and I started attending Temple Preparation class. I am so excited! I Happy, happy, joyous day! Steelers fans...aren't they great! Did you guys go over to Pittsburg? I love it there! I can't wait to go back and visit! Philly served his mission there!